Visit Cross, online at Cross.com, for fine writing instruments, time pieces, and personal accessories. The A.T. Cross Company has over 165 years of combining design ingenuity with high quality craftsmanship to create a fine selection of writing instruments and pens. 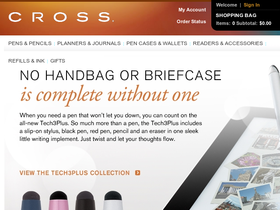 Cross.com offers ballpoint, rollerball, fountain, pencils, planners, journals, wallets, pen cases, watches, reading glasses, cufflinks, and ink refills. But before you shop for enjoyable writing instruments and accessories for yourself or for a loved one, be sure to get all the savings. Get the latest Cross.com discounts, Cross promotions, and Cross coupon codes found at RetailSteal.com. Shipping prices in the U.S. are based on shipping times. Cross also offers international shipping. Consult website for instructions. Shop at Cross and enjoy 20% savings on Year of the Snake Edition products. Click here for code. Shop at Cross and enjoy 20% savings on your order. Click here for code. Save $5 on purchases of $50 or more at Cross online today when you enter this coupon code at checkout. Click our link now to shop. Shop at Cross and enjoy free engraving on any item. Click here for code. Shop at Cross and enjoy BOGO free on refills. Click here for code. Shop for gifts as low as $25 at Cross.com. Click here to shop. Shop at Cross.com and enjoy low $8.95 flat rate shipping on orders in the U.S. Click link to shop. Shop Cross.com and save up to 75% discount in their huge summer sale. Click link to save now. Shop at Cross for chrome mechanical pencils starting as low as $30. Click link to shop. Shop for Cross rollerball pens at Cross.com with prices starting at $37. Click here to shop for enjoyable pens and writing instruments.